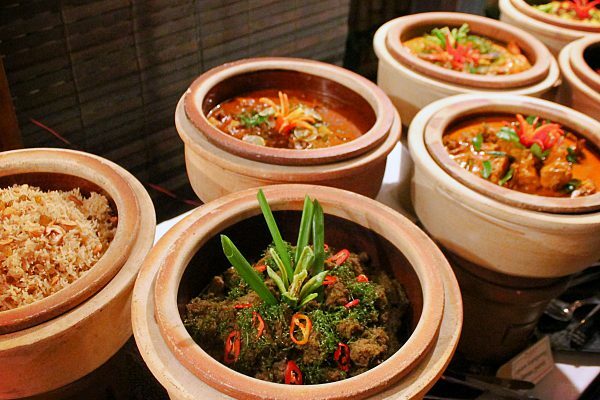 Tuck Into ‘Simply Malay’ Buka Puasa Buffet Dinner @ Bijan Bar & Restaurant! 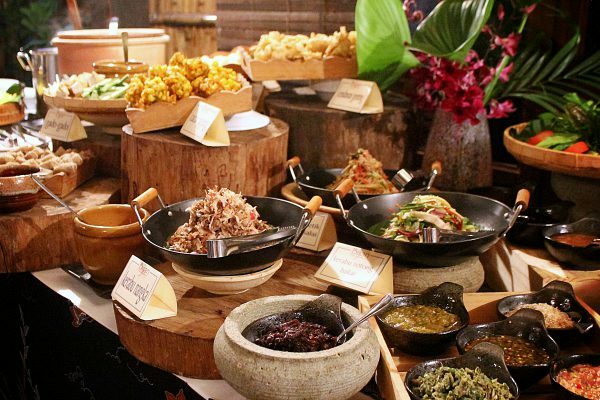 08 April 2019 08 April 2019 Categories General, TableApp, TableApp IdeasBijan Bar and Restaurant, Buka Puasa 2019, Buka Puasa Buffet, Ramadan 2019Leave a Comment on Tuck Into ‘Simply Malay’ Buka Puasa Buffet Dinner @ Bijan Bar & Restaurant! 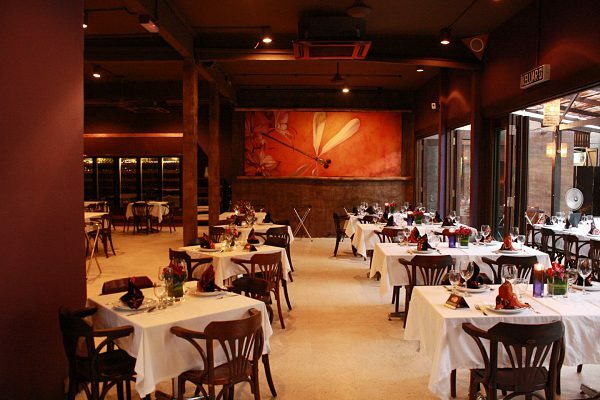 What’s better than delighting the taste buds at one of your favorite restaurants? Not to mention it is a multi-award winning restaurant focusing on fine Malay cuisine which is much-loved by discerning foodies? 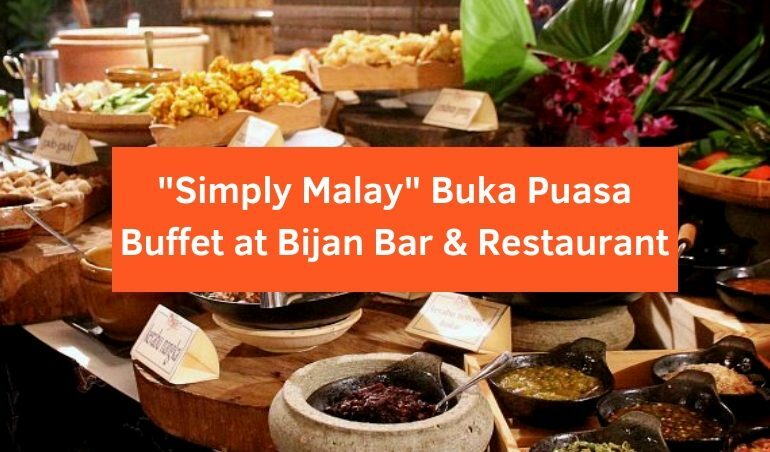 That’s why I was contented to get an invitation from Bijan Bar & Restaurant to experience their “Simply Malay” Buka Puasa Buffet Dinner to rediscover Malay food heritage with a variety of soul-satisfying dishes and heart-warming flavors. The restaurant welcomed us with its warm and lush interiors. Just a few steps away from KLCC, my colleagues and I reached Bijan Bar & Restaurant on a rainy day. The lush backdrop, artistic decorations, wonderful background music and attentive staff totally made it a perfect dining spot to cherish your moments with family and friends! 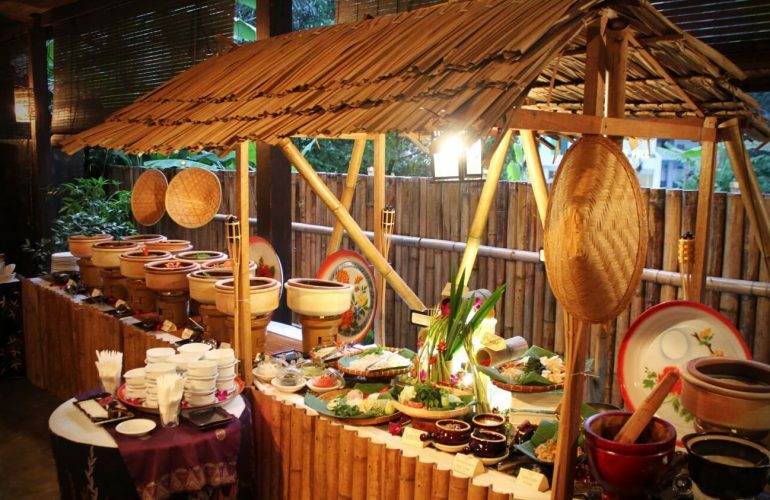 We quickly forgot about the rain earlier and were gobsmacked as in front of our eyes were buffet stations neatly set under the golden-hued light, enticing with lines of enthralling delights that we could not wait to chow down on. My eyes quickly fixed on the Satay Station as I was seduced by the irresistible aroma emanated from the enthralling pieces of the grilled-on-the-spot satays such as Satay Udang, Satay Sotong, Satay Perut (tripes satay), Satay Daging and more. Satay skewers with fascinating sizzling sounds and tempting aroma. 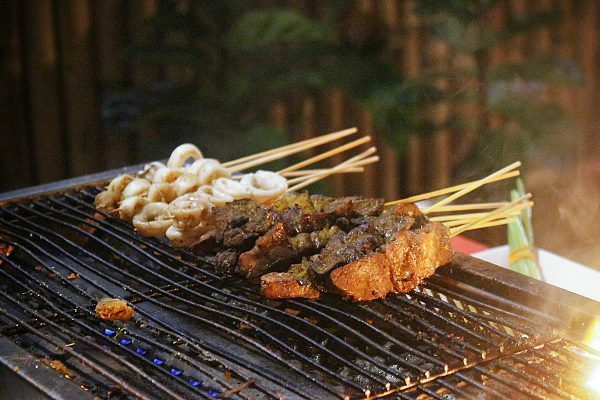 Marinated with fine herbs for hours, the satays were infused with tangy flavors while still maintaining their moist texture despite the strong heat of the charcoal. I have to give it up to the homemade peanut sauce which was absolutely outstanding. The sauce was not only delightful with its moderate sweetness but also brought out the best tastes of the satays. Amongst all, the Satay Perut amazed me the most as unlike the common stretchy texture, this Satay Perut had such tenderness that one could not resist from savoring one more! If you do not mind a bit of smoke, don’t forget to catch the chef in action as well! You should also keep an eye on the special Otak-otak which features scrumptious sea bass as it was flavorsome and also recommended by the chef! 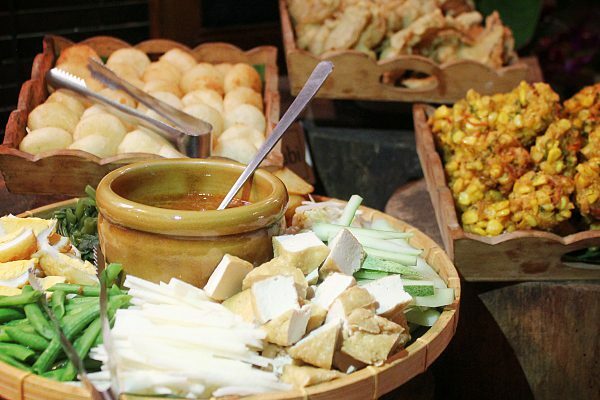 You can tease your palate with some appetizers such as Gado-gado, Cucur Jagung, Keropok Lekor and Cendawan Goreng. If you can refrain from the temptation of the Satay Station (which I failed obviously), you can embark on this hearty affair by tucking into some appetizers first. 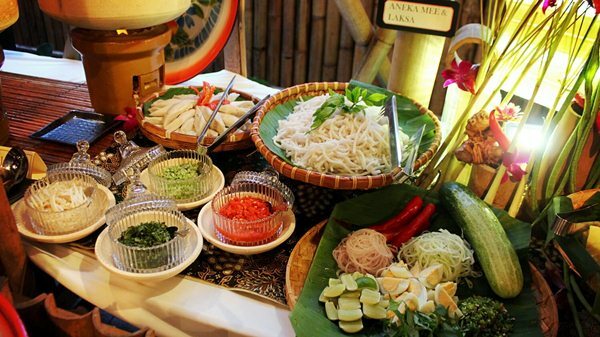 There are a variety of mouth-watering selections of appetizers for you to choose including Gado-gado, Getok Ubi, Keropok Lekor, Cendawan Goreng, Kerabu Nangka, Kerabu Betik and Kerabu Sotong Bakar. I was delighted by the Gado–gado (Lotek) for its ingredients which are light and refreshing – perfect for the start of a heavy (and yet lip-smacking) indulgence. 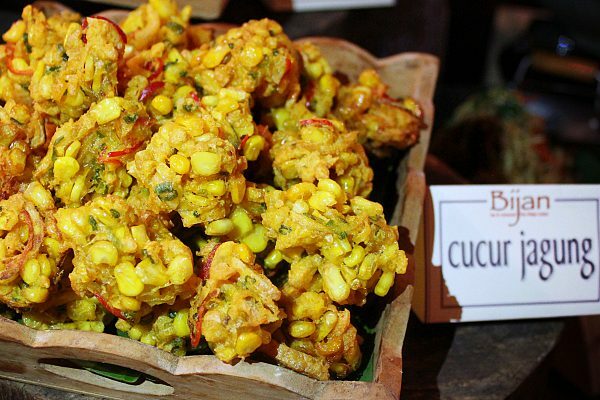 The Cucur Jagung is delightful with its crunchiness and splendid balance of sweetness and savory. As someone who loves the bursting flavors of Kerabu, I did not miss out a chance to get a taste of the 3 types of Kerabu here. 3 types of Kerabu including Kerabu Nangka, Kerabu Betik and Kerabu Sotong Bakar. Not only did the Kerabu dishes excited my taste buds with the rejuvenating freshness but they also warmed my heart with their nostalgia flavors. Bakar Station featuring Ayam Golek, Ikan Kerapu and Lidah Salai. Here comes the main dishes! If you are a fan of bakar delicacies, you would not be able to keep your feet on the ground (literally!). 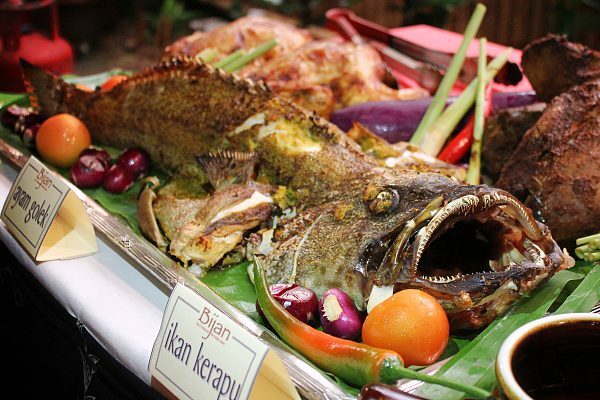 In front of my eyes was a 5kg Ikan Kerapu (grouper or garoupa) which was meticulously roasted in banana leaves! Dip its firm and smoke-infused meat into your favorite sambal and you would be elated! Did I tell you that there are up to 15 types of sambal here? Yup! You read it correctly! If you are adventurous enough, you can challenge yourself with the in-house smoked beef tongue – Lidah Salai or you can stick with a safer choice which is the Ayam Golek! Inspired by his mother’s recipe, Head Chef Razis decided to have an interesting take on the traditional Laksa by adding a little twist which resulted in an extraordinary flavorsome gravy. I crafted my own Laksa with a bit of sambal and it mingled with the Laksa perfectly. Don’t forget to scoop more broth into your bowl as you will not want to stop savoring this luscious gravy! An array of sumptuous delights with vibrant colors triggered my involuntary salivation. Happily stuffed with a luscious bowl of Laksa, I shifted my attention to an array of traditional delights beautifully nestled in clay pots featuring Udang Masak Lemak Nenas, Ayam Kampung Limau Purut, Gulai Kambing, Rendang Daging Hijau, Nasi Minyak, Sotong Masak Hitam. The vibrant colors of these dishes promised bursting flavors in the mouth and with that thought alone, I could not stop myself from the involuntary salivation. 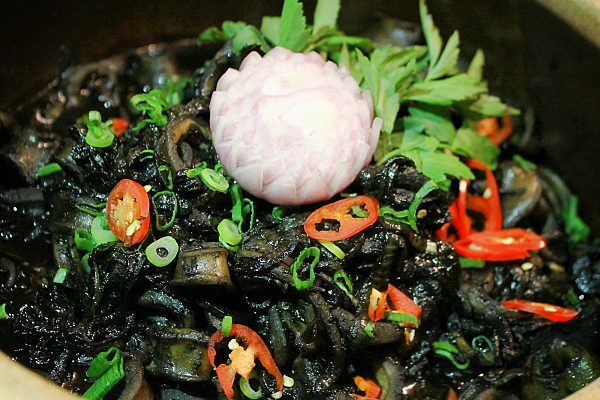 Sotong Masak Hitam with unpretentious look yet palate-pleasing taste. I started to pamper my palate with the Sotong Masak Hitam as its mysterious look triggered my curiosity. You might be reluctant by its somewhat unpretentious appearance yet keep in mind that the flavors will do all the talking! The squid was, to my surprise, superb tender yet not flaky at all with a delicate sweetness that lingered on the taste buds. 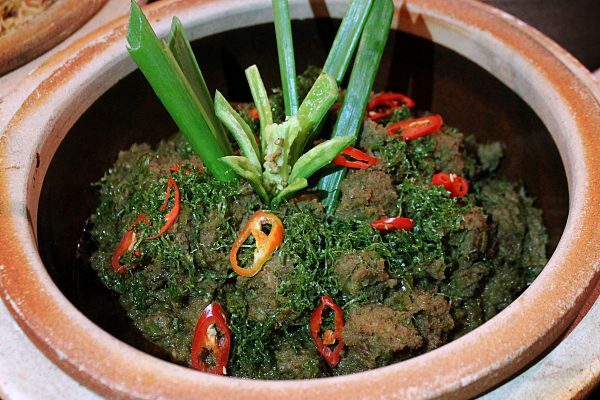 Rendang Daging Hijau is a must-try! I have always been an advocate of Rendang dishes at Bijan Bar & Restaurant and this Rendang Daging Hijau is yet another lip-smacking Rendang dish to die for! The slow-cooked caramelized beef was packed with aromatic flavors that enticed my taste buds. The beef meat was no doubt fork-tender and juicy and each bite was satisfied as it oozed an irresistible sweetness. Definitely the winner of taste for me! Ayam Kampung Limau Purut with an alluring tanginess. 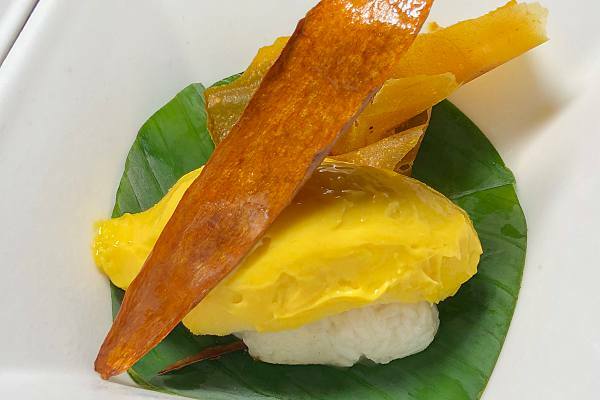 The Ayam Kampung Limau Purut is one of the chef’s favorites. This free-range chicken was cooked until it was infused with the tangy flavors from the kaffir lime leaves – a compelling combination which you should pay attention to! 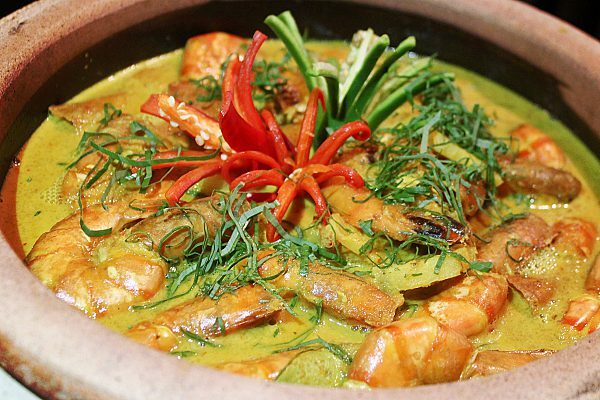 Don’t miss out the Udang Masak Lemak Nenas as its rich and enjoyable fatness would make you craving for more! Full and satisfied savoring all the main dishes, I finally indulged myself in the tantalizing morsels of desserts which, impressively, were all meticulously crafted by the chefs here. I quickly relished pieces of traditional Kuih Talam! Delicate with classic flavors, they drifted me back to the good old days! 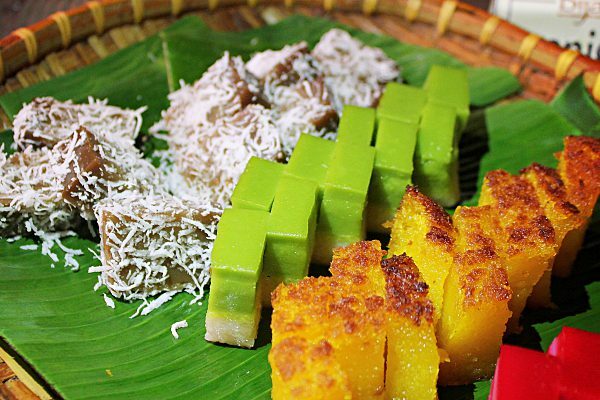 A plethora of Kuih-muih for your choice which are innovatively presented to entice your palate. 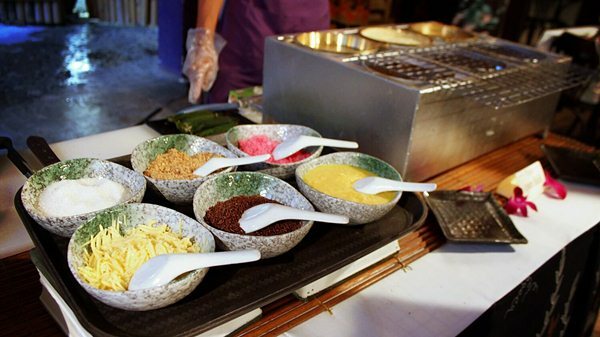 Ais Kacang Station features various ingredients for your customized Ais Kacang. I ended my hearty dinner by treating myself to the Ais Kacang which you can customize for your preference. And don’t miss out the ice-shaving machine which the restaurant has thoughtfully prepared for a fulfilled experience to enjoy this traditional favorite. I was stunned to know that this is just one of the 4 special rotating tailored menus which will be served in the holy month! These home-sweet-home delights captured my heart for its perfect renditions of old-school tastes and innovative twist. A hearty buffet to cherish the moment of togetherness! We would like to send our special thanks to Bijan Bar & Restaurant for this heavenly indulgence! 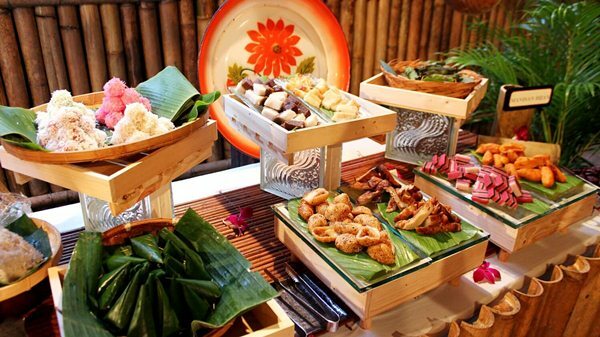 Early Bird Promotion: Book now to enjoy Simply Malay Buffet Dinner at RM110 nett per person (before promotion: RM139.20 nett) (RSVP before 9th May 2019). Dining Period: 9th – 31st May 2019, from 7:00pm – 9:30pm. Price: RM139.20 nett per person. Location: 3, Jalan Ceylon, 50200 Kuala Lumpur. Love doesn’t necessarily need expressions of words but definitely needs action and this Valentine’s Day is one of the great chances to show your loved one how special they are to you. If you are scouting for a whimsical and fascinating dining experience on this occasion, you are at the right place! We have hand-picked a number of restaurants which boast romance for a memorable time for you two! Who would not love to pamper your other half to the finest champagne and cuisine at an international multi-award contemporary French restaurant? 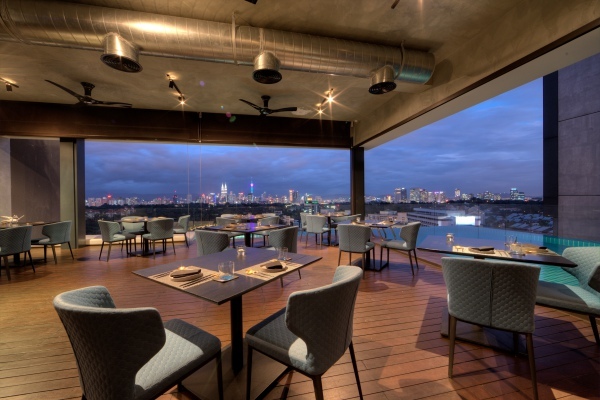 With a charming and romantic setting, a dining room with captivating views of KL Tower, enfin by James Won is your place to be on this Valentine’s Day 2019! Diners can choose a 5-Course, 6-Course Degustation menu or Caviar Degustation menu (7 tasting plates) of farm fresh organic produce featuring Mushroom Tartare, Truffle Yolk, Hokkaido Scallop Tataki, Local Prawn Tortellini, Australian Wagyu Beef, Chocolate Soufflé, Vanilla Parfait Glace and other delectable specialties. Location: Lot 2-05, Level 2, Menara Hap Seng 1, Jalan P. Ramlee, 50250 Kuala Lumpur. What’s better than reveling in a dinner filled with whimsy and wonderment while taking in magnificent view of Kuala Lumpur’s city skyline? As a restaurant with a first-of-its-kind concept – Japanese Tapas (aka Japas), Babe is definitely a unique dining spot for your special Valentine’s celebration. This Valentine’s Day 2019, getting away from the hustle and bustle of the city by enjoying a dinner at Babe with a choice of 2 tasting menus featuring delights such as Uni and King Crab Meringue, Ootoro Spring Roll, Oyster Ice Cream, Roast Hokkaido Scallop, A5 Kagoshima Wagyu Steak and other sumptuous and exciting dishes. Your special one and you are someone who love adventure and out-of-ordinary dining experience? 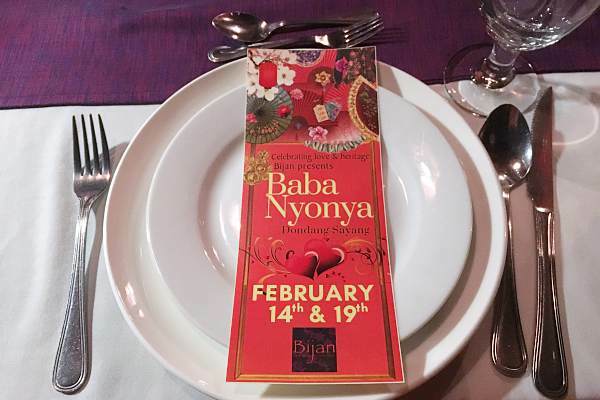 A Baba Nyonya Dondang Sayang dinner at Bijan Bar & Restaurant this Valentine’s Day 2019 would be all you could ask for! Warm yet chic ambiance with soothing music, this fine-dining restaurant is an ultimate place for a romantic escapade which will ensure a night filled with love! 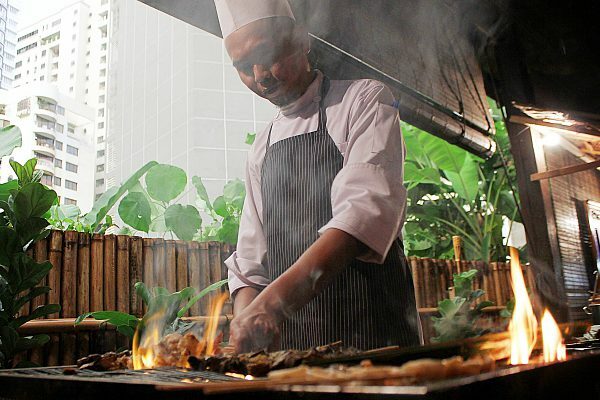 Savor a 4-course set dinner with delights like King Fish Otak-otak, Half Baby Lobster Laksa, Homemade Squid Ink Pasta, Pan Seared Fermented Prime Australian Angus Ribeye, Tapai Pulut and more unique flavors. 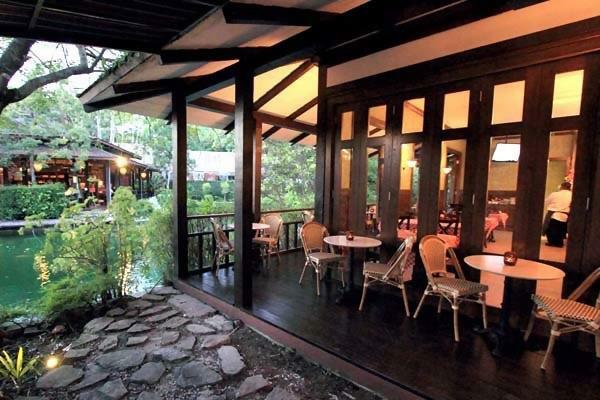 If you fancy having a special private time right within the chic compound of Sentul Park, you should not forgo a dinner at Bistro Richard Restaurant. Uniquely set in a lush, tropical garden setting with cosily lit stained-glass lamps, this European bistro is a hidden gem which is ideal for a romantic dinner. Have a memorable time this Valentine’s Day 2019 at the restaurant with a 3-course set dinner including Prawn Bisque, Oven Baked New Zealand Lamb Rack, Pan Seared Sea Bass and Chocolate Fondant with Vanilla Ice Cream and Fresh Berries. Location: Lot 268, Jalan Strahchan, off Jalan Ipoh, Kuala Lumpur. 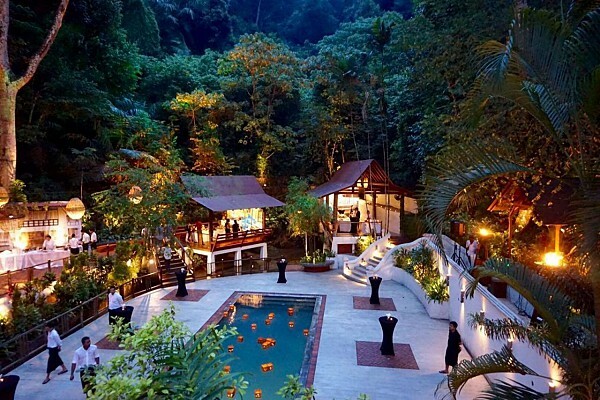 Just take a 15-minute drive from downtown Kuala Lumpur and you two will have a perfect getaway relishing a visual and sensory feast surrounded by nature! Located on the edge of a lush forest, the award-winning Tamarind Springs is an extraordinary dining spot to indulge your other half in unsurpassed natural beauty and delectable Indochinese cuisine. 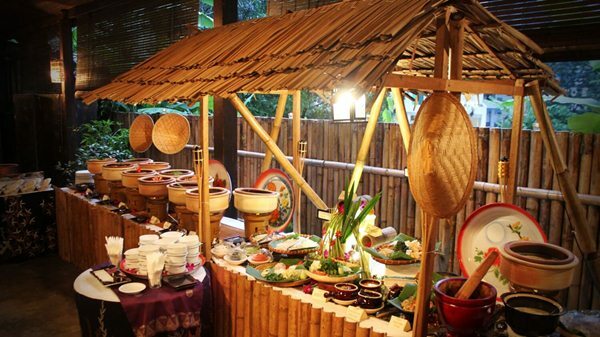 Have a jungle-luxe Valentine’s dinner featuring items such as Fresh Salmon Rolls, Seafood Otak-otak, Scallop Onion Soup, Barbeque Lamb Rack, Steamed Cod Fish, Deep-Fried River Lobster, Coconut Dragon Fruit Jelly and many other unique dishes. Location: Upper Level, Jalan 1, Taman Tun Abdul Razak, 68000 Ampang, Selangor. Still love to see more? 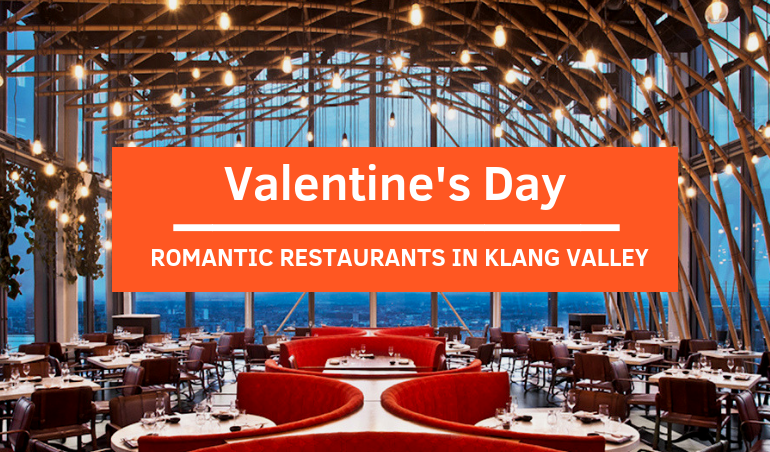 Check out our list of the Top Restaurants that Serve Valentine’s Menus 2019 in Malaysia! Have a Valentine’s Day filled with wonderment and love! 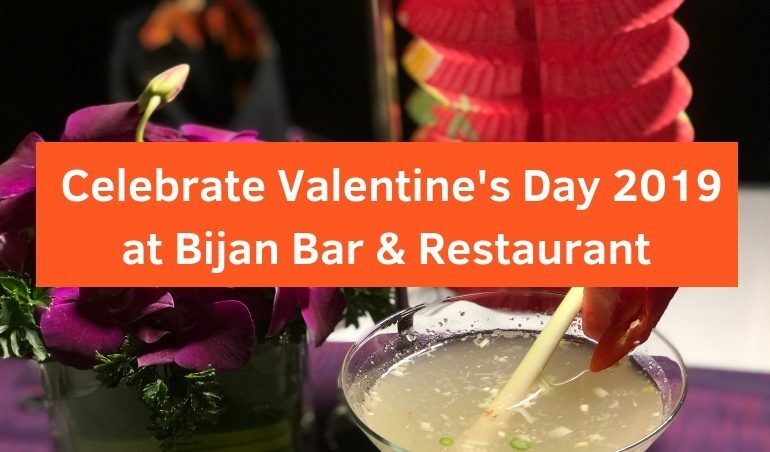 It was during the preparation for Chinese New Year that we received an invitation from Bijan Bar & Restaurant for a special sneak peak session on their Valentine’s menu. This stunned us for a little just to realize that this Valentine’s Day 2019 will take place within the Chinese New Year celebration. 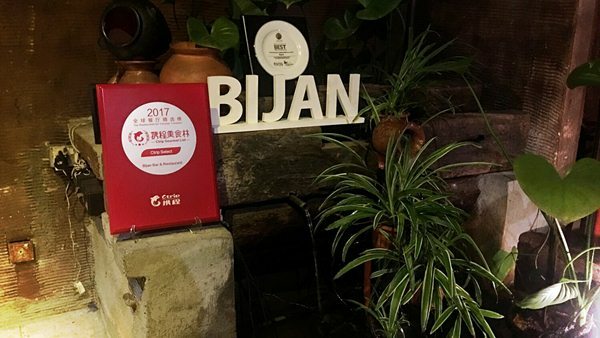 We had a dose of excitement as Bijan has always been surprising us with their innovative ways of enjoying food. 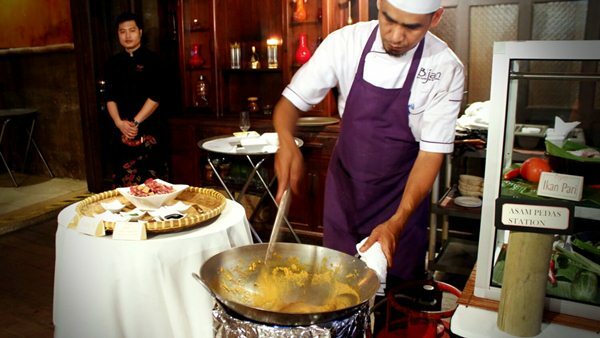 What made us more thrilled was this award-winning Malay fine-dining restaurant had come up with an out-of-ordinary menu – Baba Nyonya Dondang Sayang to pay homage to the unique Malay and Chinese cultural marriage – a thoughtful and meaningful effort for this special occasion. The table was decorated with beautiful lanterns. It took us only a few minutes to reach the restaurant as Bijan is located just a mere stone throw’s away from KLCC. Bijan welcomed us with a warm yet chic ambience and serenaded us by its soothing music background – an intimate setting for a romantic escapade. As we stepped in, the restaurant was fully packed with people. We were lucky enough to have a special table arrangement. If you are planning to visit this fine-dining restaurant, don’t forget to make reservations in advance. We couldn’t wait to start this unique culinary adventure to relish a 4-course Baba-Nyonya-inspired menu which we were introduced that it would bring a “twist on traditional offerings of togetherness”. Before starting the meal, diners will be spoilt with choices as there are 4 types of complimentary cocktail or mocktail to choose from. Each couple can pick 2 of these unique drinks. 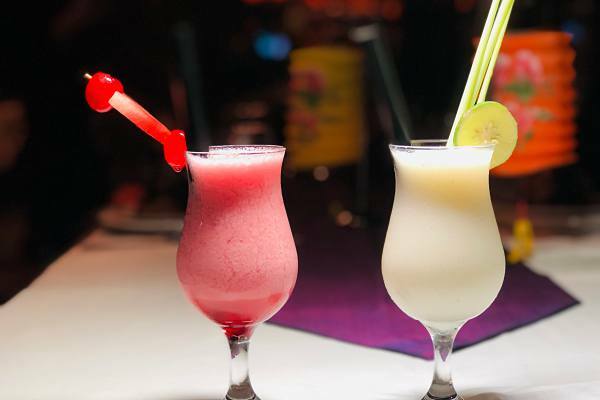 From left to right – Pink Ginger & White Hibicus Mocktail which were refreshing and subtle in sweetness. Don’t Cut Ali Cocktail which is named after the main ingredient Tongkat Ali – a natural energy booster herb. Expect a hint of coffee taste and a robust sensation with a touch of heat aftertaste. 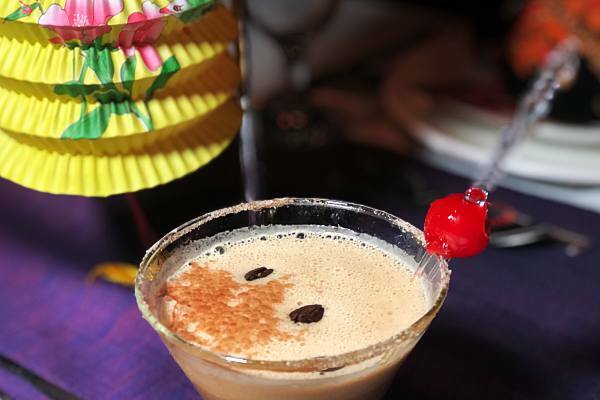 An exciting cocktail – Chili Martini which would make you say wow for the burst of flavors on the tongue. We began by reveling in Srikandi – a sharing plate featuring King Fish Otak-otak, Prawn Coconut and Banana Blossom Rolls in pairs. These bite-sized morsels were perfectly presented to showcase a different beauty of familiar offerings in a finer approach. The King Fish Otak-otak appeared in an out-of-ordinary yet fine-looking shape – cylinder, with an incredibly crispy fish skin lain on top. Take a bite and a hint of spiciness and molten goodness will excite your taste buds! The rolls impressed me as they were fried to à point and filled with banana blossoms which resulted in an absolutely crunchy texture along with a tantalizing aroma! Finally, the Prawn Coconut oozed a delicate sweetness as it was coated in coconut crumbs. Our second course – Kekapis Arjuna, totally made us gobsmacked for the seemed-to-be-caviar creation. Using 2 familiar local ingredients including budu (anchovies sauce) and belacan (shrimp paste), the chef had amazingly turned them into a caviar-like delight which exuded a delectable dollop of savory and sourness in each bite. The Pan Seared Scallop was silky smooth, ambrosially rich and delightful. 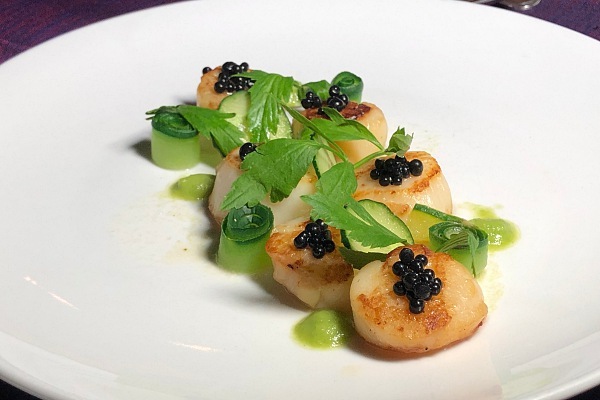 Our advice is to quickly savor the scallop after it is plated to fully enjoy its deliciousness and avoid it turning cold! First was an eye-catching bowl of Laksa Baba Nyonya classic with a yellow gravy which was so vibrant that we couldn’t stop admiring. The Squid Ink Pasta (which nestled under the lobster) was skillfully handmade and perfectly mingled with the subtle creaminess of the laksa. I was in love with this dish as the heap of piquancy from the laksa excellently accentuated the lobster flavors and the Otak-otak was incredibly spot-on. The Daging Salai Angus Nasi Ulam was a true show stopper! 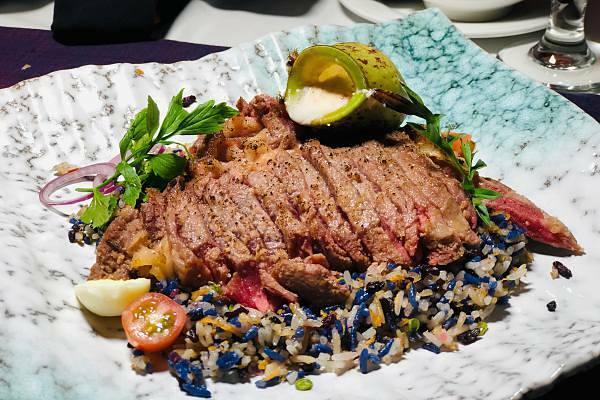 Beautiful slices of Fermented Prime Australian Angus Ribeye were set on top of a colorful bed of Roasted Smoked Rice and Herbal Tricolor Rice. Only the best rice was hand-picked to be smoked for 6 hours under slow fire for the best flavors. 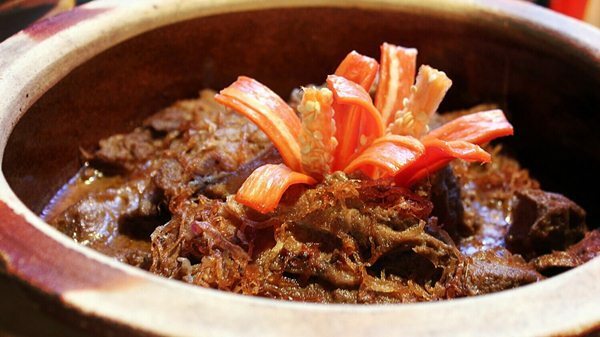 The 3-day fermented beef also amazed us with its juiciness and an irresistible beefy taste in the mouth. The restaurant’s homemade sauce, which was put in a pitcher plant (wow! ), was splendid as it enhanced the beef taste. We relished everything about this dish! We ended our meal with two superb delicacies which the flavors still linger in our mind up till now. First off, Nila Seputih Saljiu which is Wajik and Bunga Telang Rambutan Sorbet Served on a Bed of Coconut Snow. 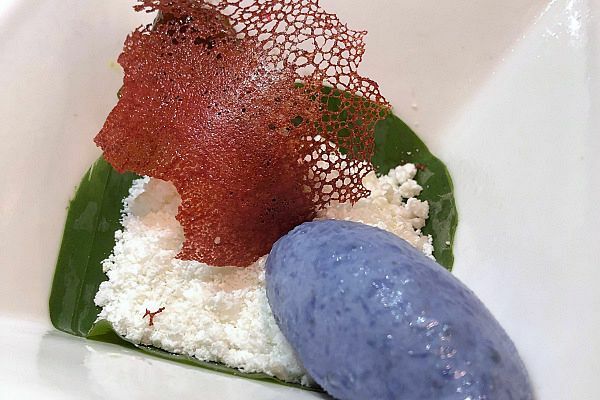 The sorbet was not only tantalizing for its natural color from the butterfly pea flower but also sumptuous with a subtle sweetness from the rambutan. The wajik (sticky rice cake) was an exquisite addition as it went well with the melt-in-the-mouth coconut snow. 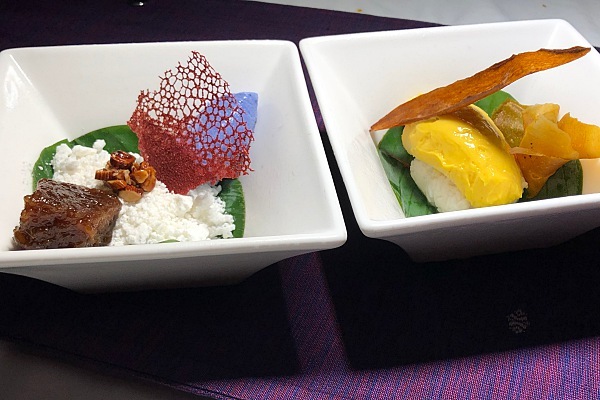 Next was Bersepuh Emas which is Tapai Pulut and Mango Sorbet With Crispy Mango Skin and Fruit Leather. The use of mango skin as a part of this delight totally made us astonished! To be honest, I did not know mango skin could be this tasty! The Tapai Pulut, using family-heirloom recipe, was one of the best I’ve ever tasted. A spoonful of this combination was enough to titillate my palate and capture my heart. 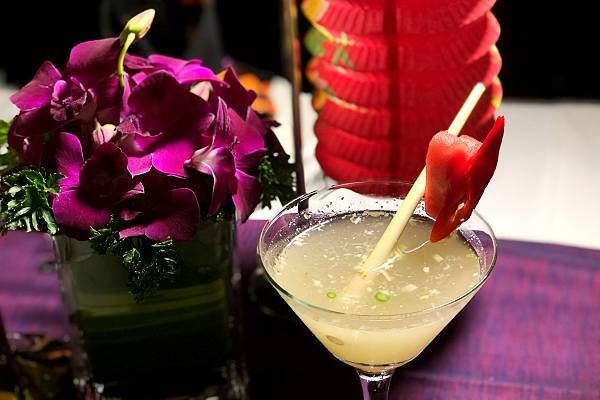 As a celebration of Valentine’s Day and the last day of Chinese New Year (also known as Chinese Valentine’s Day), the menu will be available on 14th & 19th February 2019. We expressed our wish of having the menu throughout the entire week, yet the chef revealed that he had to arrange this to preserve the highest quality of the ingredients – another reason for us to pay respect to this man! Special thanks to Bijan Bar & Restaurant for having us on this sensory journey to excite the palate and delight our heart and soul. Thank Chef Razis for inspiring us with your creativity, passion and thoughtfulness in each dish. Time: 14th & 19th February 2019. Being known as one of the most well-marbled steaks of all, the Black Angus Rib Eye is a delight that hardly any beef aficionados could resist. The steak is packed with such beefy flavors that just a pinch of salt and black pepper is enough to accentuate its tastiness. 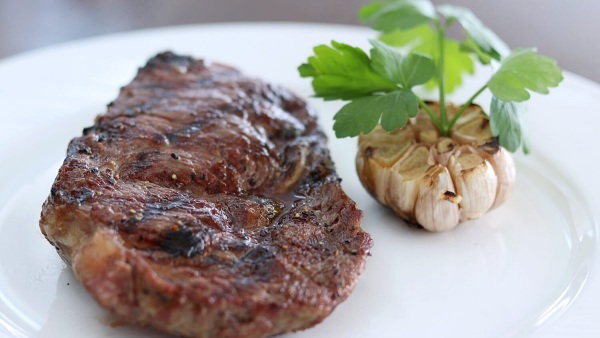 Grilled to perfection, the rib eye will gratify you with its natural tenderness and exquisite taste which would keep you coming back for more. Despite its unpretentious presentation, this Beef Ribs Served in A Dry Green Curry has such a flavor that will make you feel awestruck. The beef can easily entice your taste buds with its hint of sweetness from the coconut milk and fresh smell from the Thai basil. Every shred of the meat exudes a succulent taste which will give you excitement in every bite. Rich in flavor and amazingly tender, this dish is a real winner in taste! 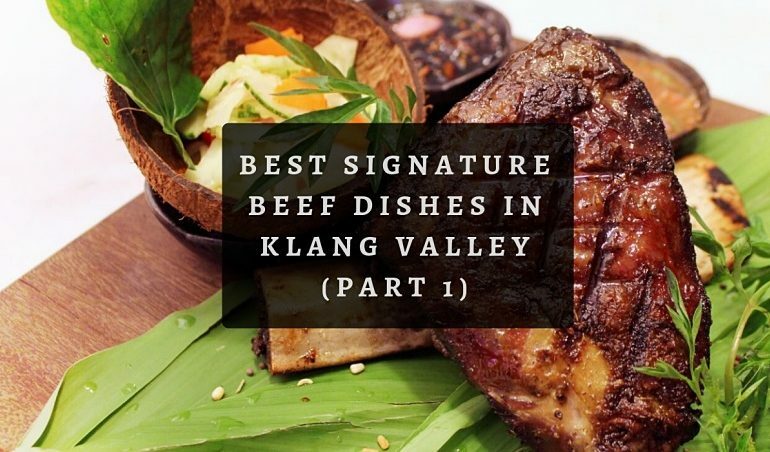 A true beef connoisseur would not ignore this Daging Rusuk – a whole solid big chunk of meat presented nicely along with acar, air asam jawa sauce and sambal kicap sauce. 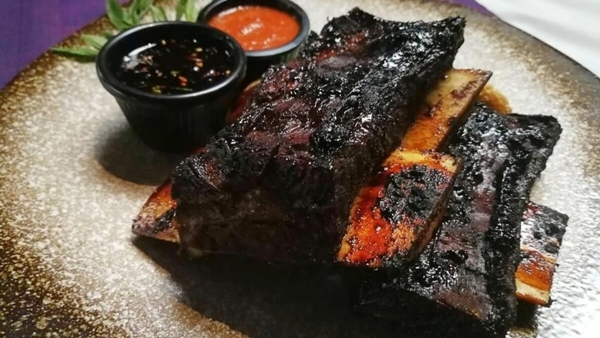 After hours of marination, the beef rib is grilled to perfection on an open coal fire until it has a beautiful charred skin which can easily whet your palate just by its look. Flavorful and juicy, each shred of the meat will disintegrate on your tongue without further notice. Mingle the beef with the air asam jawa sauce and its citrus taste will balance out the strong flavor of the beef while the sambal kicap will enhance the beef’s sweetness. 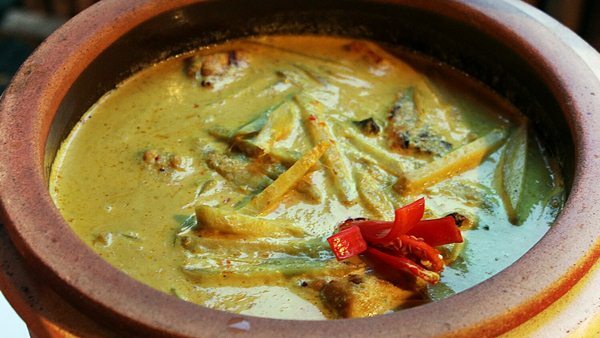 If you are an avid foodie who loves traditional Malay dishes, this Rusuk Pangang is a definitely a dish you cannot forgo! Only the best Australian short ribs are carefully chosen and meticulously prepared to be char-grilled until it is on point. Not only filled with beefy taste which is absolutely palate-pleasing, the dish is skillfully prepared to give diners a refreshing twist. 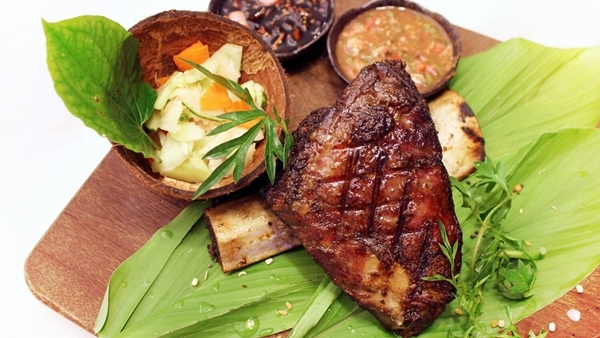 The perfectly grilled short ribs are served with pegedil, sweet soy sauce and of course the all-time favorite sambal belacan. Beef with espresso? Yes, you saw it right! Should you scout for an adventure in taste, look no further than this Espresso Braised Short Ribs. 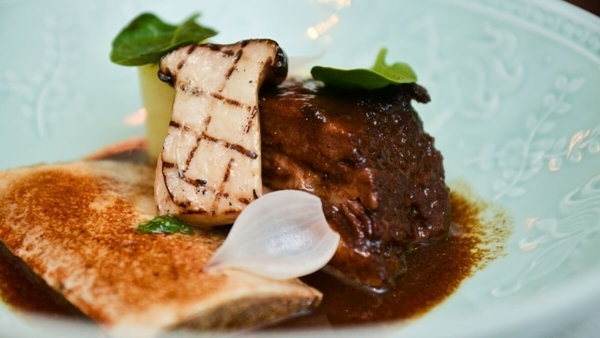 The short ribs are selected carefully by the chefs to be slowly cooked for hours with fine condiments, soft fondant potatoes and king oyster mushrooms before being braised in the special bittersweet espresso sauce for hours until it’s lip-smackingly tender and moist. A superb delight for those who love to delight their taste buds. Last week, we received an invitation from Bijan Bar & Restaurant to a sneak preview of their Kampung Warisan Buffet to celebrate this Ramadan 2018. 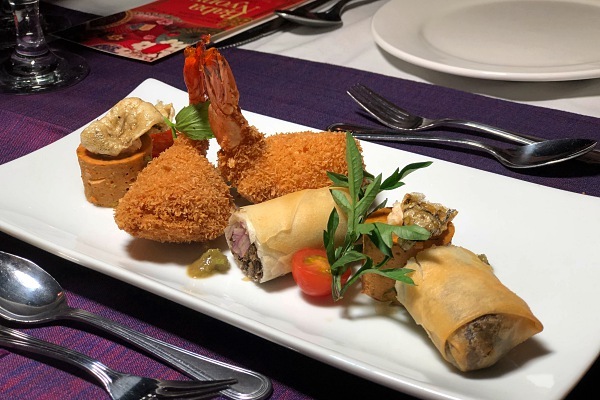 We had a great deal of excitement and expectation as we were about to enjoy a sumptuous feast at one of the upscale Malay fine-dining restaurants in KL. In this holy month, the restaurant will serve a compelling assortment of fine cuisine in kampung style curated by Head Chef Shawai and his culinary team. Of course, my team and I would not pass up this chance. With its classy and stylish furnishings, Bijan welcomed us with soothing Malay music in an intimate ambiance. We were stunned as in front of our eyes was an extravagant spread of delectable appetizers, mains and desserts laid out on the buffet aisle. It was really enjoyable to see live-cooking stalls with friendly chefs who tailor-made all of these old-school favorites. We were ready to get spoilt! A friendly chef at the live-cooking stall, cooking Rendang Tok. I went to the clay-pot section and found myself overwhelmed with various appealing delicacies. 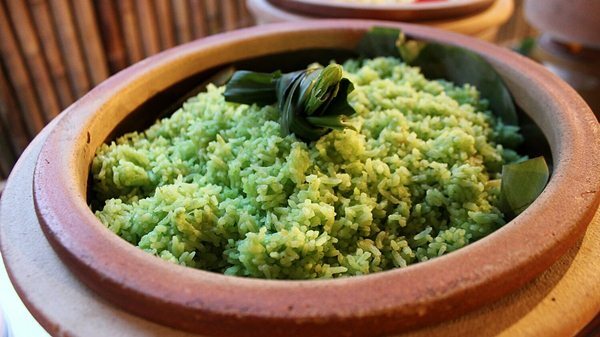 I started with Nasi Lemak Pandan as it had an eye-catching green color and inviting sweet scent. 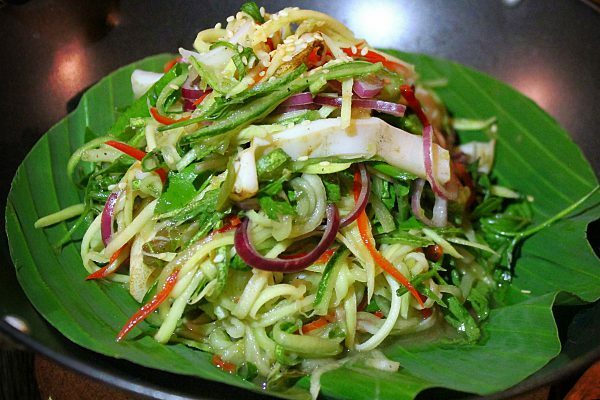 It was tender and fluffy, aromatic and ambrosially rich in flavor exuded from the coconut and pandan leaves. The Nasi Lemak with its subtle creaminess and sweetness was downright great! I’ll tell you my little secret! Mix the rice with this Masak Lemak Ikan Salai Bacang and it would be a sublime combination. 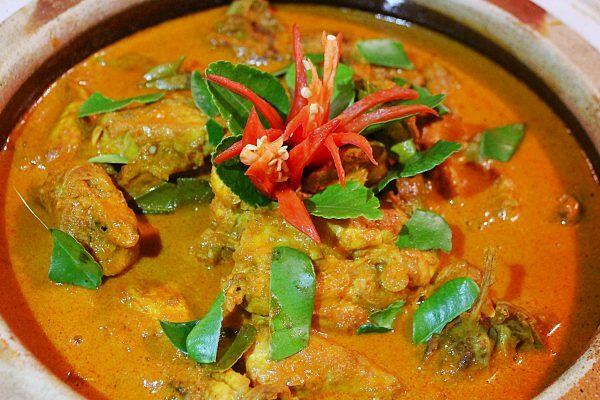 The Masak Lemak Ikan Salai Bacang stood out with its yellowish gravy and a red flower-shaped chili lain on top of it. I love how tastily rich and soft the Ikan was yet it was not flaky at all. The Bacang was an excellent choice as it added a bit of sweet and sour flavor; hence, balanced the greasiness of the fish. Next came Kerutup Itik and Opor Daging. First up, Kerutup Itik. The Kerutup was gratifyingly tender with a tantalizing scent coming from various herbs and spices. A hint of piquancy lingered on the tip of my tongue, followed by a natural sweetness from the duck. What I love the most was the spot-on moistness of the meat as without a skillful hand, the meat can either be excessively juicy or overly dry. 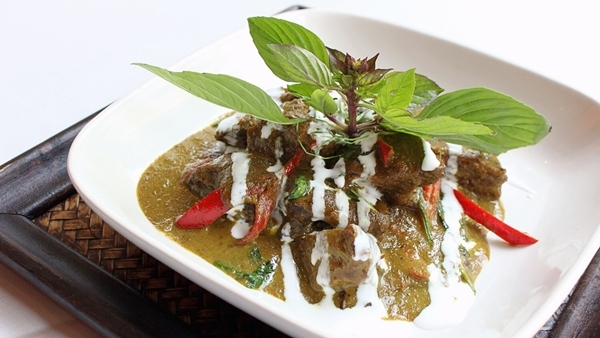 Opor Daging – which is beef slowly cooked in coconut milk, allured me by its impressively flavorful smell. It was, of course, tangy and fat as a result of being braised in the coconut milk. At the same time, the beef was incredibly tender and within a few seconds inside the mouth, the Daging emanated a comfortably beefy taste which was absolutely outstanding. If you are prawn aficionados then it’s time to whet your appetite because these two upcoming dishes will definitely capture your heart. 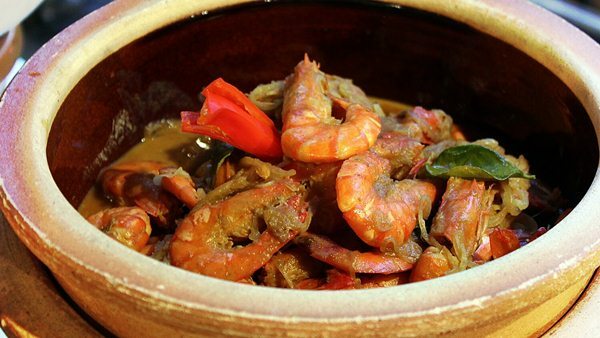 Udang Sambal Berempah is a spicy dish that would also mingle perfectly with the Nasi Lemak Pandan. Though its spiciness tingled my whole tongue, the freshness of the prawn was still spot-on. A decent heap of spices and heat crept into my nose and enticed all the taste buds. Simply too good to pass up! The next dish, Udang Tempoyak, triggered my curiosity with its name. What would it be to taste udang with tempoyak (fermented durian)? I was swept away after the first bite – the prawn was so rich and deep in flavor which I believe only tempoyak can bring such taste to it. The udang oozed its own sweetness which was then complimented by an exquisite flavor and fatness from the tempoyak. This intense richness was so addictive that I could not help but picked one more piece. It was such a guilty pleasure. I could wait no more to introduce my 3 favorite dishes of the day. 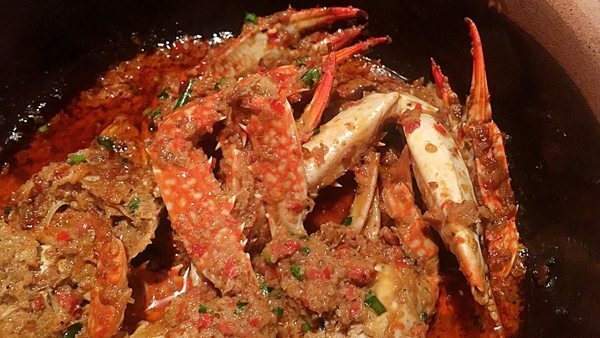 Coming first is the Ketam Cili Bersantan – a flower crab unlike any others. Don’t be deceived by the Ketam Cili Bersantan‘s unpretentious look as your mind will be blown after the first bite. I was gobsmacked! The crab was perfectly cooked until its meat became buttery, incredibly soft and truly melt-in-the-mouth. There is no shortcoming in terms of taste. It totally won my heart for its tantalizing creaminess and perfect spiciness. And I know I might sound over-exaggerating but it was truly heaven in your mouth! 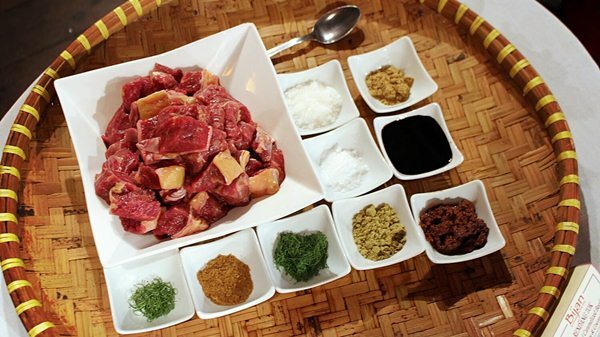 The ingredients for Rendang Tok were arranged nicely at the live-cooking station. 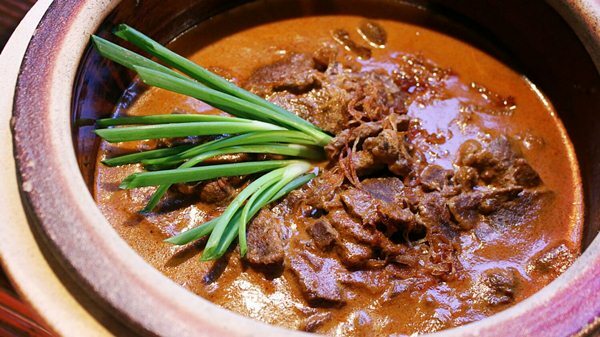 The mouth-watering Rendang Tok after being cooked. The golden-hued ‘kerisik’ (toasted coconut) and its tempting smell silently triggered my salivation. The beef was wonderfully flavorful! The luscious sweetness from the beef mixed nicely with the kerisik which then enticed all the five senses. Every shred of the meat boasted a tangy and honey-like flavor on the tip of the tongue. What can I say? Extraordinarily scrumptious! 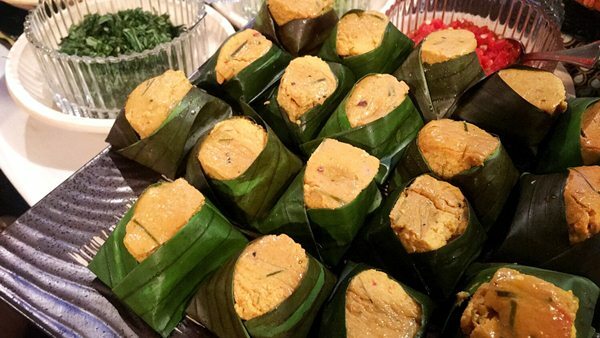 It took me a few seconds to realize these stunning morsels are Otak-otak. Innovatively wrapped in a unique way which showcased its attractive yellowish color, the Otak-otak totally captured my attention once they were brought out. Its incredible tenderness was spot-on. I still remember vividly the spiciness, fieriness and molten goodness blended well together in just one bite, leaving my eyes close in admiration. I was totally in awe! I am an ardent advocate of Kerabu, to be honest. I love the burst of rich and fresh flavor when the Kerabu hits the tongue and the robust aftertaste that lingers once you savored every morsel. Of course you should not miss the 3 dishes of Kerabu here which are Kerabu Isi Ketam, Kerabu Ikan Pari and Kerabu Kerang Bersantan. It’s time for some noodles! I grabbed a bowl and started to customize my own Laksa Kedah. A hint of “pedas-ness” hit my tongue within a second, followed by the combination of sourness and sweetness from the broth. If chili is not enough to titillate your taste buds, just take a dollop of sambal for a spicy kick! It was the first time I had ever heard about Laksam – a laksa dish which is commonly found in the East Coast. The rice noodles were made nicely into multi-layer flat rolls. I was excited to shower these fine cuts with the rich and creamy kuah putih – a white gravy made from coconut and fish. 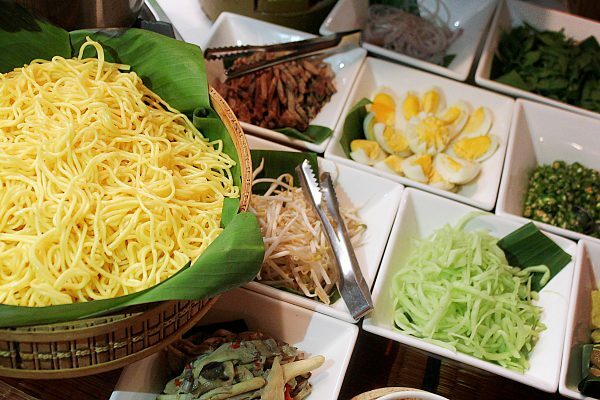 The softness and freshness of the rice noodles made every bite a pleasant treat. The kuah putih was tangy and as elegant as it seemed, it added a hint of coconut flavor which was enjoyable and slightly sweet. I love it! Don’t forget to pay a visit to the Asam Pedas stand which tucked away in the corner. Here you can pick your favorite ingredients such as Ikan Pari, Ikan Kembung and Daging and get the fiery hot Asam Pedas brought to your table in the blink of an eye. Finally, it was time to please my sweet tooth – dessert time! 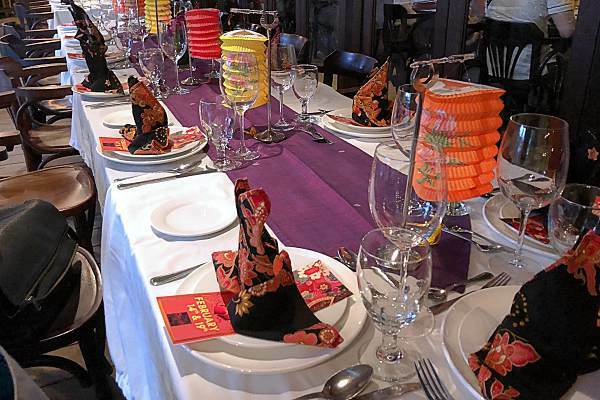 The bite-sized desserts fed our eyes with their attractively colorful looks and various shapes. Here comes a quick tour for it. My two most favorites are Apam Balik and Pengat Pulut Durian. I firstly went to the Apam Balik section as it was freshly made on the spot and you can customize your own Apam Balik! Nevertheless, the chef would generously give as many sprinklings and fillings as you want! The Apam Balik here was truly a delicacy for the soul. 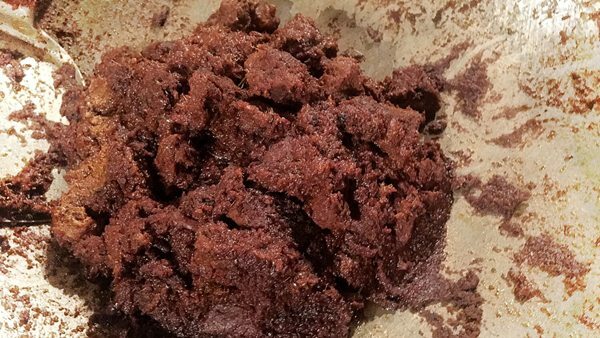 It was crispy outside yet moist inside, oozed a luscious scent and of course, an additive sweetness that you cannot resist. 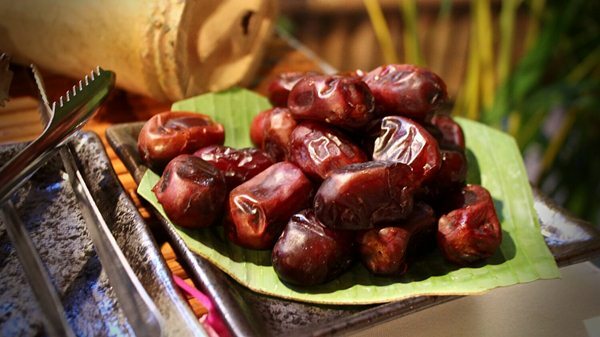 Finally, take a piece of date because who would not want this piece of blessing? 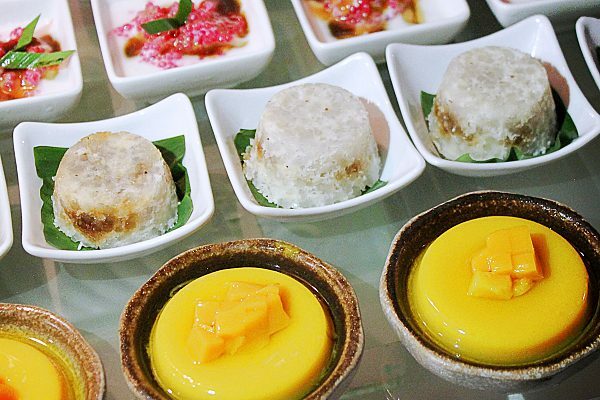 The Pengat Pulut Durian which is glutinous rice with durian sauce was a true indulgence for durian lovers! The durian sauce was creamy and fat as usual and it will definitely melt your heart. Don’t forget to try the Bubur Caca which was just as delectable and the all-time favorite Kuih Muih which made me totally enthralled by their moderate sweetness and fluffy softness. After all this heavenly indulgence, I was overwhelmed to know that this is just a prelude to more dishes coming in 4 specially rotating tailored menus served in this holy month. 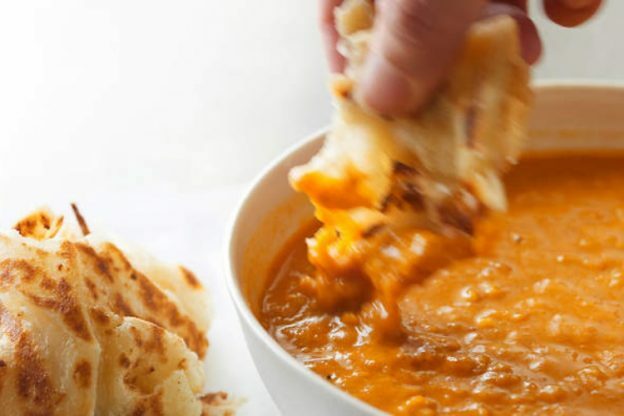 These luscious delights really nurture my ever-growing love for Malay cuisine with its perfect renditions of old-school tastes as well as innovative flavors. Special thanks to Bijan for this opportunity. 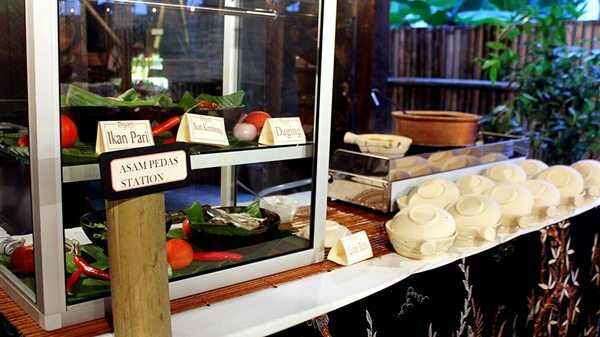 >> Click here to book a table at Bijan’s Kampung Warisan Buffet. RM110++ per person. Early bird at RM100 nett per person before May 21, 2018. Time: Available from May 21 to June 13, 2018. Buffet from 7pm to 9.30pm. A-la-carte menu from 9pm onwards. From Nasi Lemak to Musang King, check out these creative dishes and drinks inspired by Malaysian flavours! 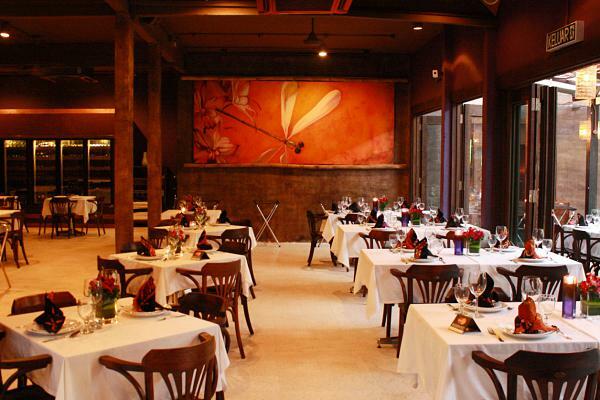 Antara Restaurant is set in a beautiful period building established in 1919 along off Jalan Raja Chulan. The restaurant is set in a colonial environment and the cuisine takes you back to how home used to taste like, with no shortcuts or MSG. 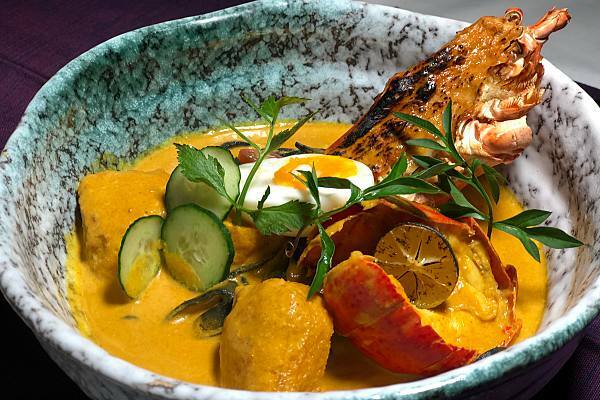 We recommend their Marron Lobster Sarawak Laksa which its broth is creamier and thicker than the usual laksa, and takes 3 days to boil. 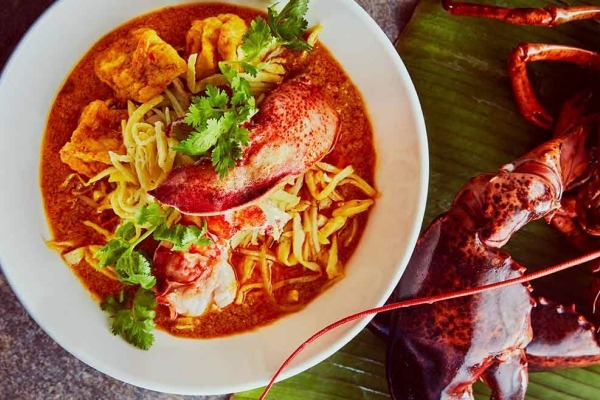 In the laksa you will spot fresh Marron lobster, 100% pure rice noodles, handmade tofus from Bentong, Bintulu belacan hand pounded with chilli, and fat strands of bean sprouts. 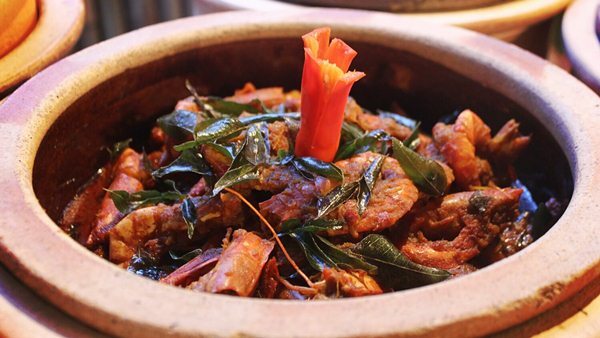 In conjunction with the 60th Merdeka celebration this year, Signature at The Roof has put a twist on Malaysian's favourite local dish. 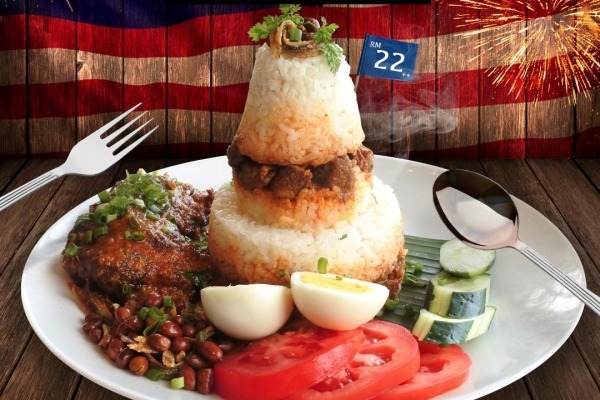 What could be better than a Nasi Lemak Tower this Merdeka month? This mouth watering specialty is available for a limited time only, until September 2017. 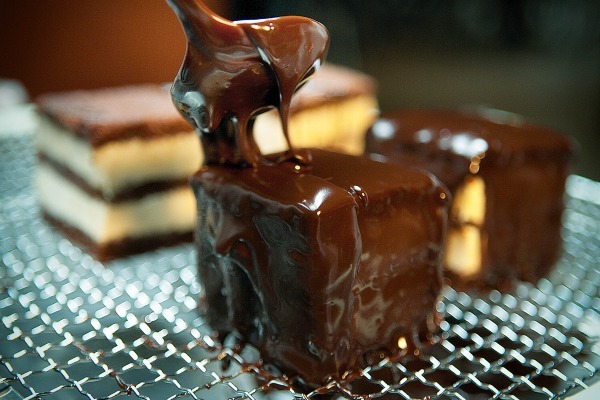 Chocolate Durian Cake, created by one of Bijan Bar and Restaurant’s founders, Lissa is a must-try when you are here. The unmistakable durian aroma blends in well with the chocolate between the soft spongy cake layers. A slice of heaven, trite as it sounds. 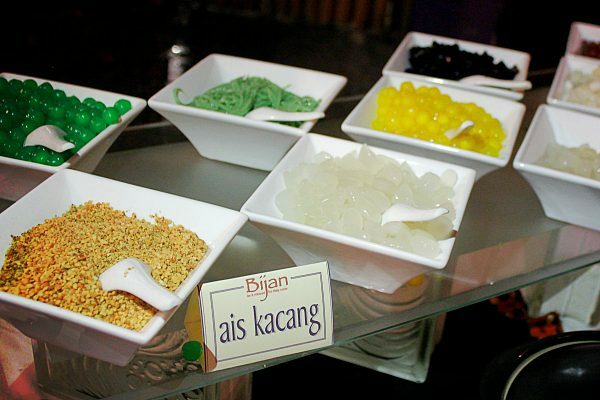 Bijan also has a unique selection of desserts like homemade ice cream in local flavours, creamy durian cheesecake and pandan pudding. 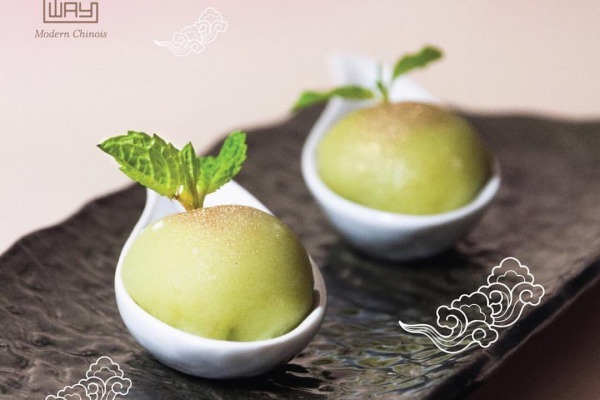 Combining two great loves by sinking your teeth into the Maosang King Mochi at Way Modern Chinois, a Modern Asian restaurant situated at Damansara Heights. Another popular durian dish at Way Modern Chinois is their Durian Pancake which uses musang king durian for its filling. You got to try these at least once! 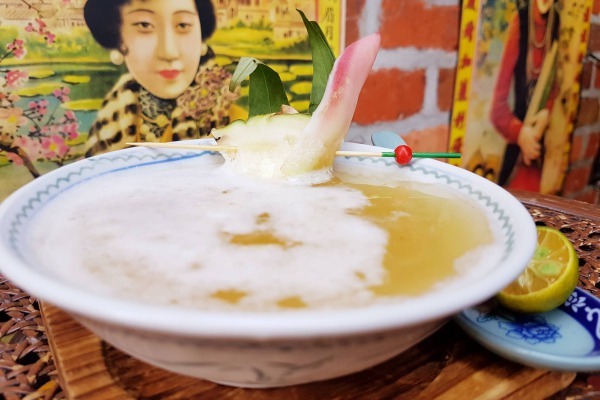 Grab the wild, crazy, jaw-dropping Asam Laksa Cocktail at Opium which is situated in Changkat Bukit Bintang. 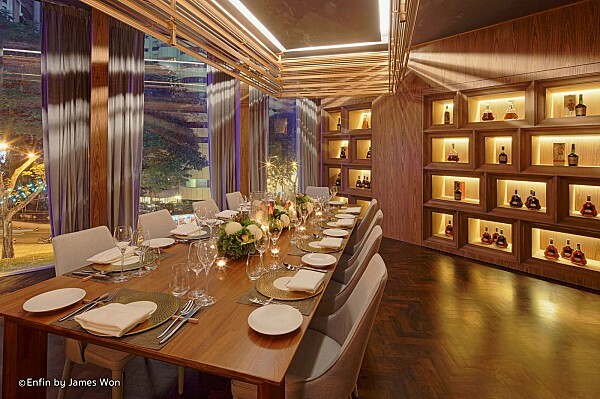 The interior of the restaurant is inspired by the Opium regimes of the east. Pair the Asam Laksa Cocktail with other unique dishes such as Phoenix Dumpling, Fern Leaf Salad, Crispy Duck Noodles, Wagyu Beef Rendang, and the signature Beef Brisket & Tendon Stew just to name a few.